But At A Calculated Risk. The next few minutes will change your approach to investing, forever. By that, we don't mean lackluster fixed deposit returns! Let’s say, in double digits! And the next few years, according to our research, seems to be interesting. Want to build ample financial backup for your child's education? Want to significantly increase your retirement corpus for the future? Want to save enough for that foreign vacation? Want to maximize your average return on your total investments? Live your life...financially free and secure. That's not what this letter is about. Before we proceed, let's face one of the harshest facts of life. However high returns may seem attractive, the very act of chasing them all day and night is rather taxing. Following financial journals every day, listening to financial shows on TV, consulting your financial advisor...it's quite hectic! And even then, you are almost completely disappointed with the profits you make. What if we tell you that from this day onwards, you don't have to spend another minute on your investments? What if we tell you that from this day onwards, you don't have to depend only on "investment advisors" who just want your money? ...The part where you were probably forced to act on bad advice, day in and day out. ...The part where you took investment decisions you did not completely believe in, but yet went along because you did not have a choice. ...The part where all that your investment portfolio did was probably disappoint you. ...NO staying glued to the TV or bending over business newspapers trying to comb for individual stocks all the time. ...NO losing your sleep worrying about how your portfolio is doing every minute of your life. ...NO trying to beat the market in vain to lose significant sums of money every time. ...NO spending a fancy sum of money year after year on investment advisory services that promise everything but deliver nothing! Imagine if you could grow your investments on autopilot, and still relax in your easy chair and enjoy your life, with your friends, family and relatives. Finally, you can send your daughter to the foreign institution for her higher studies. Finally, you can pay-off your loan and call your house your 'home'. Finally, you can sit back and relax, and cherish the world around you. Finally, life seems so interesting and meaningful. ...Because finally, you have the free time and money to live life well! In fact, it is very likely that many successful investors you know, use this strategy to build wealth consistently and effortlessly over time. This clever strategy has been around for a long time...but known only to the successful investors. And fortunately, you will discover it today, changing your investing outlook forever. What Is This Special Strategy? No, you do NOT invest in a variety of stocks. No, you do NOT invest in any one mutual fund. No, you do NOT hedge risk with derivatives even. No exceeding the limit of seven mutual funds in your portfolio. Not more than two schemes from the same fund house will be included in the portfolio. Once you are done with this, now comes the MOST IMPORTANT part of this whole unique strategy of investing. We call this “Core + Satellite” Strategy of Investing. What’s so unique about this? If we were to explain it in layman’s term, we would say that this strategy aims to get the best of both worlds, that is, short-term high-rewarding opportunities and long-term steady-return investing, and the good thing is, it works! The term “core” applies to the more stable, long-term holdings of the portfolio while the term “satellite” applies to the strategic portion that would help push up the overall returns of the portfolio, across market conditions. Our research states that 60 percent of the portfolio is reserved for Core mutual funds and the rest 40 percent is invested in the Satellite mutual funds. ...On differentiated investment styles with greater focus on optimum portfolio allocation. You see, this investment strategy is applied only by a handful of successful investors, and no doubt, it is going to be rather difficult to deploy. Whew! Being an average investor, will you be able to create such a portfolio? But then again, will you be able to pick out the right funds by yourself? Will you be able to put in hours after hours into analyzing the vast universe of mutual funds and beat the money managers in their game? Will you be able to work 9-to-5 daily and still have the energy to sit down with thousands of studies and journals every night? Will you be able to put up with this daily for the next 7-8 years? Don't worry. We understand you. We understand that it is not possible for an average investor to put this concept to work, just by himself. Although you might want higher returns from your investments, you need to have time for yourself and your family too. We believe that while building wealth is important, sacrificing life is definitely not the way! And thus, to make your job a lot easier, we have brought to you what you may want the most. Because we have created a readymade portfolio for you...for 2025. ...A robust mutual fund investment strategy, to build wealth consistently over long term. "The Strategic Funds Portfolio For 2025"
Based on the concept of "Strategic Portfolio Theory", this premium report will help you build your optimum mutual funds portfolio for 2025 WITHOUT any effort on your part. In this exclusive report, you will get to know the top time-tested equity mutual funds that have shown the ability to build wealth over a long period. Our research team, with their years of experience and extensive knowledge about mutual funds, have gone to great lengths to find out potentially the best and consistent performers across market conditions. Show superior consistency in performance over a long period. Show stability and reliability across various market cycles. Strike a better risk-return trade-off over time. Are managed by process-driven mutual fund houses. Rank highest in terms of active portfolio quality. All you have to do is consider investing your money in the funds recommended in the strategic portfolio, in the suggested allocation and you may reap benefits like you have never done before! "I am obliged to PFN for educating me in management of personal finance. I have designed my MF portfolio taking guidance from PFN. I appreciate prompt responsiveness of PFN team to subscriber queries, and their approach to take onboard subscriber requests and feedback. In particular, I liked research reports for a couple of funds which clearly guide investors not to invest in spite of high returns, due to underlying risk and doubtful sustainability of returns in the long term. This differentiates PFN from other MF research services." Following the “Strategic Portfolio Theory”, we have chosen just a handful of diversified equity mutual funds out of over five hundred floating in the market, for you to consider investing in for superior long term gains. A large-cap oriented fund with a track-record spanning over two decades, that has established itself in the large-cap category with its consistent long term performance and has rewarded investors with superior risk-adjusted returns. The fund has not only kept risk under control, it has managed to deliver benchmark-beating returns as well. Its ability to curb the downside risk makes it an ideal fund to provide stability to your portfolio. A large-cap equity fund that has outperformed the benchmark by a substantial margin in the past five years, while keeping volatility in check. The blend style strategy followed by the fund allows investors to benefit from a mix of stability and growth. The fund scores high on risk-adjusted returns and has managed to deliver superior returns at a much lower volatility compared to the benchmark. This makes it an ideal fund to form your core portfolio, keeping an investment horizon of 5 years and more. A fund that has lived up to its name, with a value investing style that has rewarded investors substantially over the past decade. The fund seeks undervalued stocks without comprising on quality. The diversified portfolio and sectorial allocation along with stable fund management makes the fund a dependable proposition for a core holding in one’s long-term portfolio. The fund has delivered superior risk adjusted returns and follows effective portfolio strategies that should benefit investors having high appetite for risk along with an investment horizon spanning five years or more. A midcap fund that has set itself apart from its peers by rewarding its long-term investors, without taking excessive risk. The fund has delivered superior risk-adjusted returns for its investors. The fund manager looks for high growth oriented stocks in the mid cap segment, which are available at fair and attractive valuations. Being a mid-cap oriented scheme, high volatility cannot be ruled out and thus has been placed in the satellite portion of the portfolio. Therefore, you should be prepared for the risk associated with the fund. Nonetheless, if you can bear the short-term pain, the long-term gains can be rewarding. An opportunities style fund that has shown a turnaround in performance and has gradually climbed its way up the ranks over the last couple of years. The fund has performed extraordinarily well, posting a substantial margin in outperformance when compared to its peers. Though the volatility is comparable to that of other schemes in the category, this fund now scores high on risk-adjusted return and thus adds to positives that ranks the fund higher. Its investment style makes it an ideal contender for the satellite portfolio. A well-managed equity oriented hybrid fund that has not only outperformed its peers, but outpaced equity diversified funds as well. The fund uses sound risk management processes to deal with volatility. This has enabled the fund to outperform across market cycles with superior risk-adjusted returns. The funds strategy of diversifying its equity assets across sectors and market-caps with limited portfolio churn helps it lower the risk, while its allocation across large-caps and mid-caps enables it to outperform the peers in a bull phase. You could consider investing your money in these 6 funds and just forget about it for next few years...or to be specific, till 2025. And after 2025, your portfolio could potentially return you in the double or even TRIPLE digits! Of course, there is a chance that this might not happen... 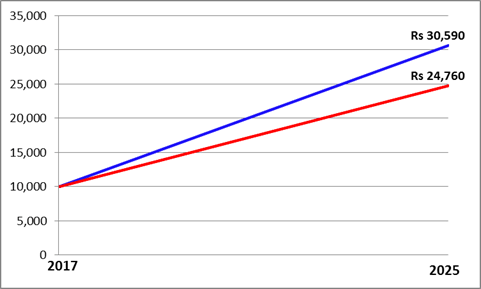 But then to make this kind of returns, you need to take that extra bit of risk. You may reap BIGGER gains at a relatively lower risk, than in plain old stock or bond investments. Not to mention the fact that you do NOT have to put in any effort on your part. No spending countless hours of time following stock movements on TV. No reading thousands of research reports to know which funds to Buy every passing year. No anxious checking of performance every now and then. The simplicity of this theory is what makes it unique and useful. "With their unbiased research and personalized financial planning, PersonalFN helped me overcome the fear of investing into mutual funds. I think I have become an informed investor, thanks to the easy-to-understand literature and research articles that PersonalFN publishes and their friendly staff who never pressurize a customer into anything." The thing to understand here is that it is not just about calculating and evaluating the returns of a bunch of mutual funds. It is more about which investment style is going to perform well and which is expected to fail in the long term. It is more about reading between the lines than reading the numbers. ...and needless to say, it requires a lot of research and qualitative study. If you select the wrong funds, the whole theory crumbles and your investment go down the drain. However, it is worthy to be noted that if you select the right combination of funds, you may sit on gains much bigger than you can imagine. And that we did...for you. Under quantitative parameters, we evaluate the fund’s performance over different time periods and market cycles apart from measuring volatility to judge the underlying risk; while the qualitative parameters are used to evaluate the performance of the fund management and their investment style vis-a-vis the mandate. Our recommended schemes not only stand out on the basis of consistent past performance (as per the quantitative parameters) but also come with superior investment return potential in the future (as per the qualitative parameters). In other words, these 6 mutual funds have already proven themselves, both qualitatively and quantitatively. As an investor, this might be THE portfolio that you were looking for. In terms of returns, it might be potentially the BEST you can hope for. Assume if you invest Rs 10,000 today in a portfolio of these SIX chosen funds, it becomes around Rs 30,590 in 8 years’ time, at a growth of over 200% (that is, an annual return of just 15%). Even if we are to be a little conservative and consider an annualized return of 12%, which is very much possible given the present-day circumstances, it still returns around Rs 24,760 - a eight-year return of 147%! Not bad, right? "I was reviewing my portfolio today. I am happy to note that all my investments have outperformed market both in down as well as up market condition. The recommendations of PersonalFN are unbiased and generally have a long term views suitable for common investor like me. "When I look back, the timely advise and assurances of PFN, quite contrary to experts on TV during the last years downturn not only saved me from huge loss, it helped to maximize my return in the cycle. I once again thank you all in PersonalFN for educating common investors and unbiased advice." No need to waste hours listening to blathering talk-heads on TV. No need to subscribe to costly business journals every day in vain. No need to sacrifice your present to gain in future. All you have to do is click the link below and the secret to achieve potential higher gains for the next 7-8 years will be opened to you! Since we want this exclusive report to be accessible to as many investors out there as possible, we have presented it as a one-time offer to you! Instead of the normal price of Rs 2,000 that we charge for this type of once-in-a-lifetime valuable opportunity, we will charge you just Rs 950. That's a whopping discount of over 50%! Yes, this limited opportunity comes at a nominal one-time fee only. You do not have to pay any yearly subscription or recurring charges! For a nominal price of Rs 950, you will get access to a readymade portfolio that has the potential to fetch higher returns without any heavy effort on your part whatsoever. Considering the fact that you might potentially reap returns in the double or triple digits, this is just a nominal cost, frankly speaking. Multiply your wealth like you never did before. Get one step closer to becoming truly financially secure and free today. As we already told you, this letter is going to change your life. This opportunity is available only for a limited time period. After that the price will revert to Rs 2,000. Remember, this report will help you create your ultimate "portfolio of portfolios" for 2025. Absolutely, WITHOUT any long-term subscriptions and renewals. Be ready for an exciting financial journey this year onward. Take action NOW and prepare for a better tomorrow. Get Our All-New 2018 Edition of our Premium Report "The Strategic Funds Portfolio For 2025" Now. Click Here! P.S. Don't miss this awesome opportunity. Get your hands on our all-new report on our recommended mutual fund investment strategy for 2025. Remember, this is a limited period offer and may vanish soon! P. P. S. This report is strictly meant for “high reward, moderate risk” investors who want to gain consistent returns on their investments and willing to stay invested at least for the next 7-8 years. 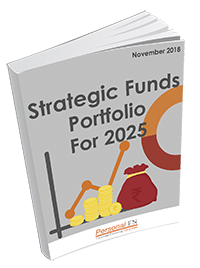 Our Exclusive Report "The Strategic Funds Portfolio For 2025" Is Available At This Deep Discounted Price Only For Limited Period. Click Here To Claim Your Copy Now. � Quantum Information Services Pvt. Ltd. All rights reserved. Disclaimer: Quantum Information Services Pvt. Limited (PersonalFN) is not providing any investment advice through this service and, does not constitute or is not intended to constitute an offer to buy or sell, or a solicitation to an offer to buy or sell financial products, units or securities. All content and information is provided on an 'As Is' basis by PersonalFN. Information herein is believed to be reliable but PersonalFN does not warrant its completeness or accuracy and expressly disclaims all warranties and conditions of any kind, whether express or implied. PersonalFN and its employees, personnel, directors will not be responsible for any direct / indirect loss or liability incurred by the user as a consequence of him or any other person on his behalf taking any investment decisions based on the contents and information provided herein. Use of this information is at the user's own risk. The user must make his own investment decisions based on his specific investment objective and financial position and using such independent advisors as he believes necessary. The performance data quoted represents past performance and does not guarantee future results. As a condition to accessing PersonalFN's content and website, you agree to our Terms and Conditions of Use, available here.